Spring has finally sprung, although the temperatures are still a bit cool. My bulbs are blooming, and it was time to make a pretty springtime table. My inspiration for the setting was this adorable wheelbarrow I found at the thrift store. I liked the soft colors on the painted wood, and the little tulip stencil on the side. So, digging into the silk flower stash, I pulled some pink tulips and white daffodils with yellow cups along with some greenery. I placed it on a white tablecloth. I have a small collection of rabbits, and I think of them as spring and not necessarily an Easter decoration. 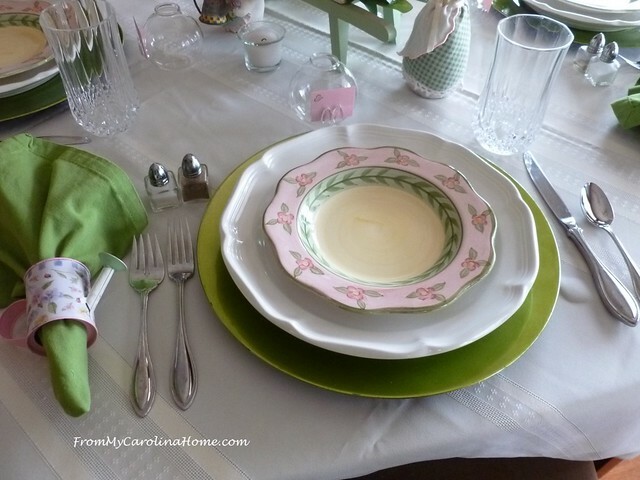 The place settings began with the spring green chargers, topped with our white everyday stoneware and the pink flower salad dishes, also a thrift store find a couple of years ago. This table will use mostly things I have shown before in previous tablescapes, but not in this combination. It is fun to use what is on hand in a new way. Looking through the napkin holders, I remembered the watering cans found last year. 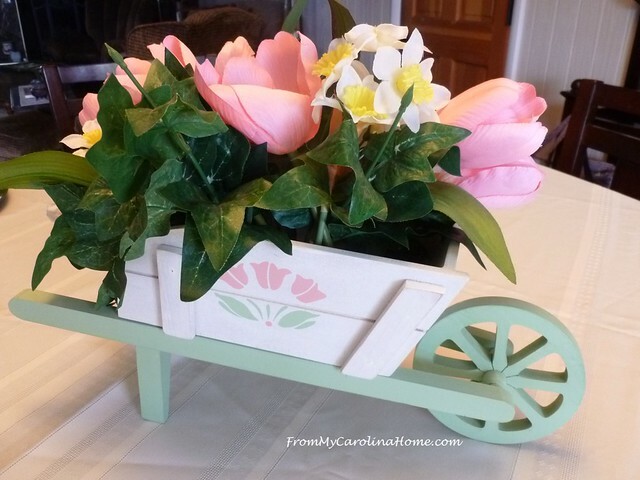 With the pink handles and soft green accents, they go well with the garden theme. I add everyday flatware and individual salt and pepper shakers to each setting. Water glasses are added next. I went down to the meadow edge and clipped some cherry blossoms from the tree that is flowering now, with DH’s help. 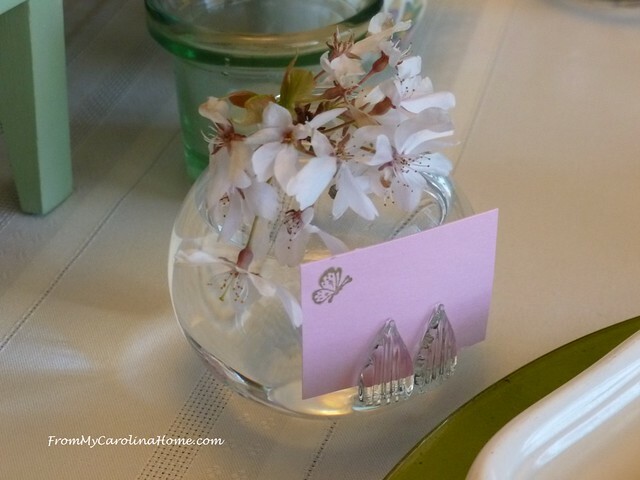 I filled the little place card vases with water, and added the flowers. There are two little leaves on the front to hold a place card. These were a fun find and are called Be Seated Place Card Vases. 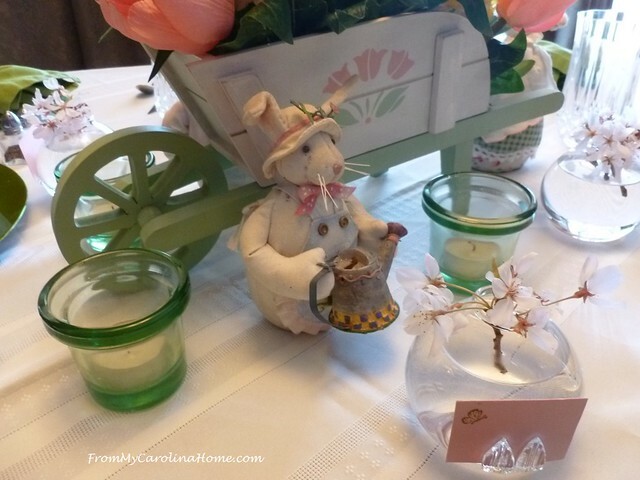 On one side of the centerpiece, I placed a rabbit holding a watering can, along with two green votive holders with unscented tealight candles. I like the combination of spring green and pink with just a few yellow accents. I kept the table simple for everyday use. Here’s the other side, with another rabbit holding some flowers. Here’s a closer view of the little vases with the fresh cherry blossoms. I’ll replace the flowers and fill out the seating cards if I have some friends over for lunch. All I need to do to make it transition to Easter is add a few eggs. Then the eggs can be put away and the rabbits kept out for the rest of spring. 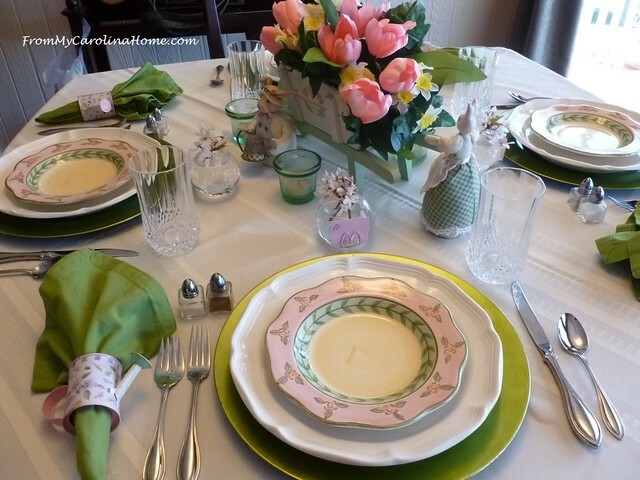 You can see my Easter theme tablescape from a couple of years ago HERE. I don’t have the Easter egg plates shown in that post anymore. Yes, sometimes I do let dishes go, LOL!! Not often, but sometimes. 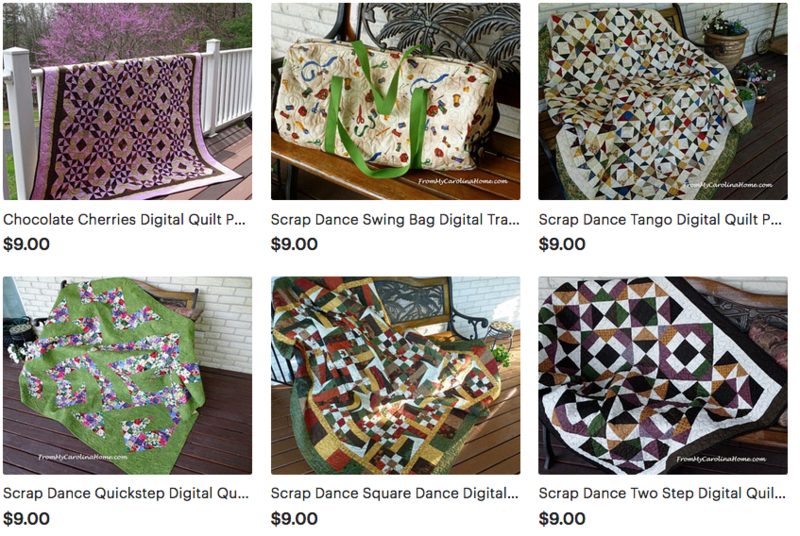 See more of my tablescapes with the Tablescape category on the sidebar. All done and ready to enjoy springtime meals everyday. What is on your table for spring? 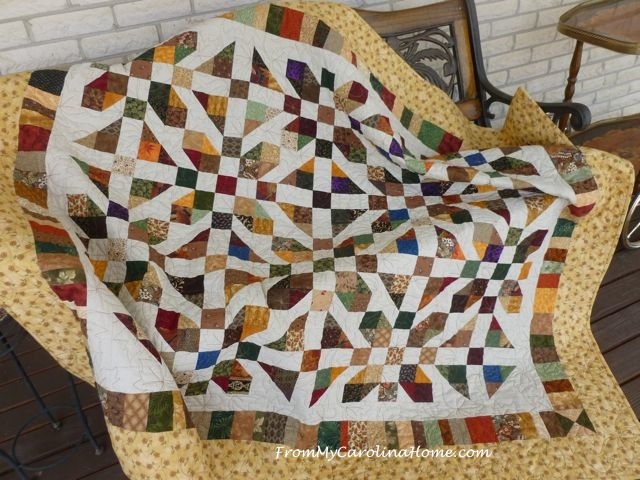 50% Off First 3 Months Bluprint Subscription + 15% Off Future Orders Of Kits & Supplies! It’s back for today only! 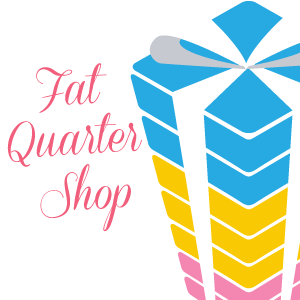 Get your first 3 months for 50% off + an extra 15% off every time you shop! OR FREE Starter Box With Annual Bluprint Subscription Start an annual subscription to unlimited streaming classes & get a FREE starter kit. 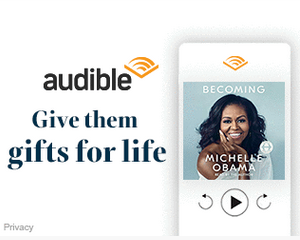 Both offers end 3/24/19. 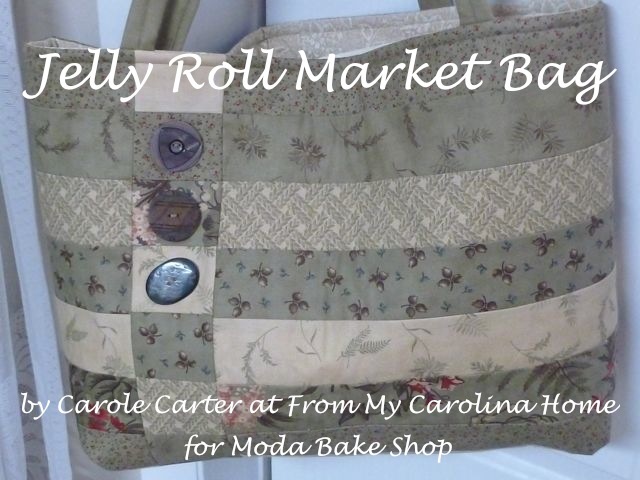 Carole, you have set the perfect table for spring! I love the cute wheelbarrow and your sweet rabbits. 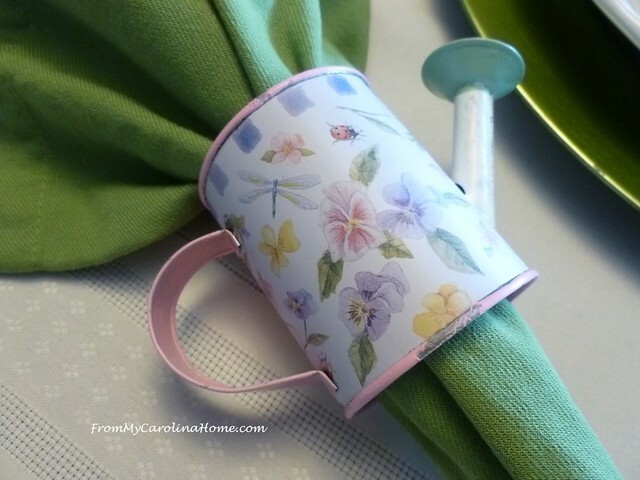 The watering can napkin rings are so sweet. Happy Sunday! 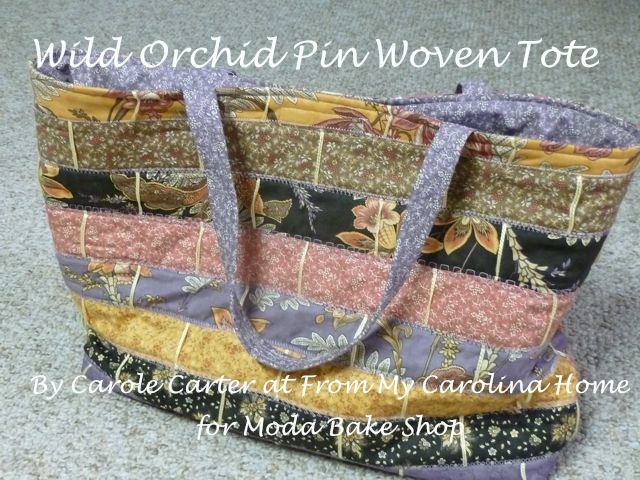 So sweet and a very delightful collection of pretty things for Spring. Yes, the trees leaves are unfolding and the buds are popping – every morning my eye lids are sticky. Carole, I love all your tablescapes, but WHERE do you store everything? That is adorable. I love all your thrift store finds. All the soft colors look beautiful. I have never seen card settings like that. And the napkin holders are so cute, I love watering cans. It may be simple but it is beautiful. 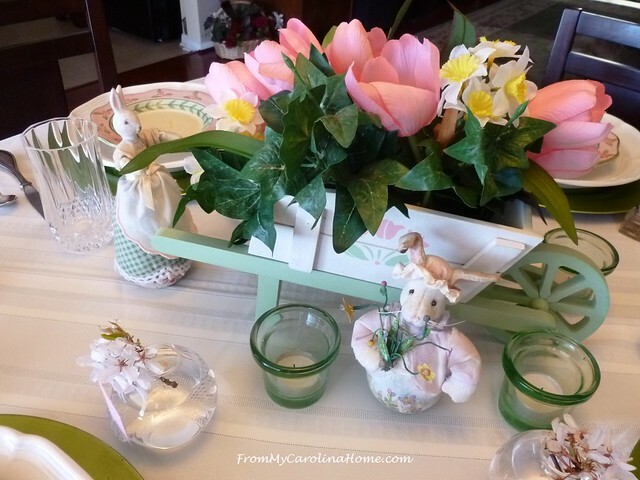 Good morning Carole….I really enjoyed your spring tablescape with the soft colors and watering can napkin holders. You always set the ‘perfect table’, no matter the season. 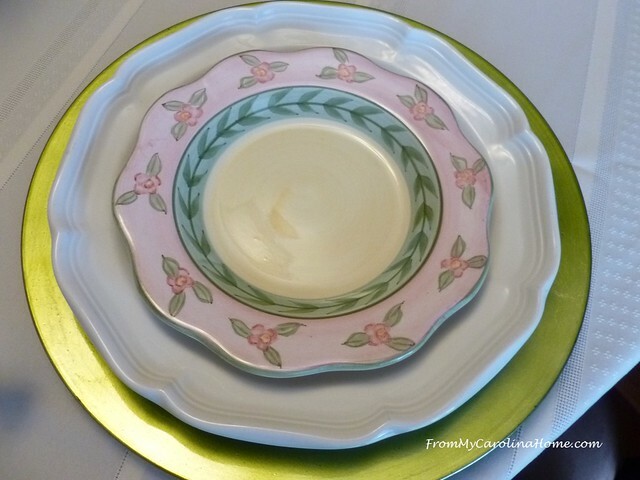 I snuck back to see the Easter egg plates you mentioned, and thought they were so pretty, but the ones you are using now, are definitely a more practical pattern to carry over from spring to Easter. 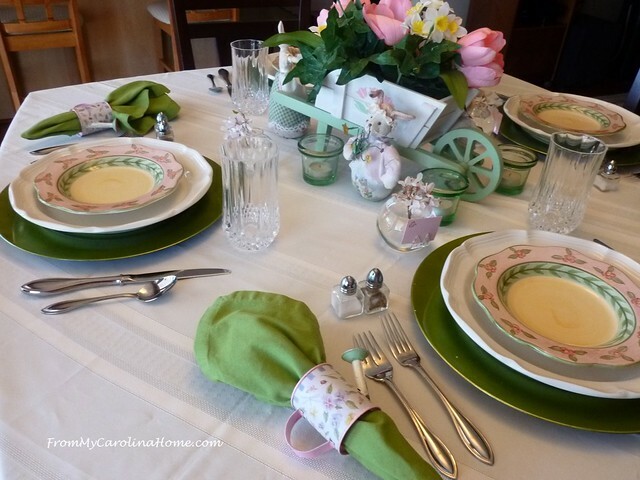 Lovely spring tablescape, Carole!! If only spring would happen!! Still a little col, but the trees are beginning to bud. beautiful place settings you do set the prettiest tables! 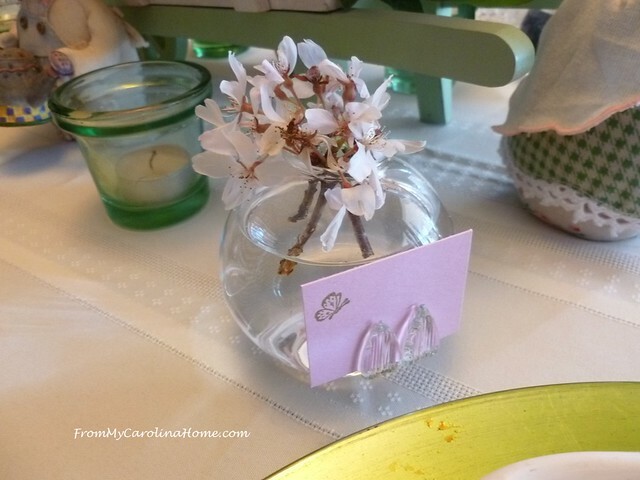 Love your cherry blossom vase name holders! 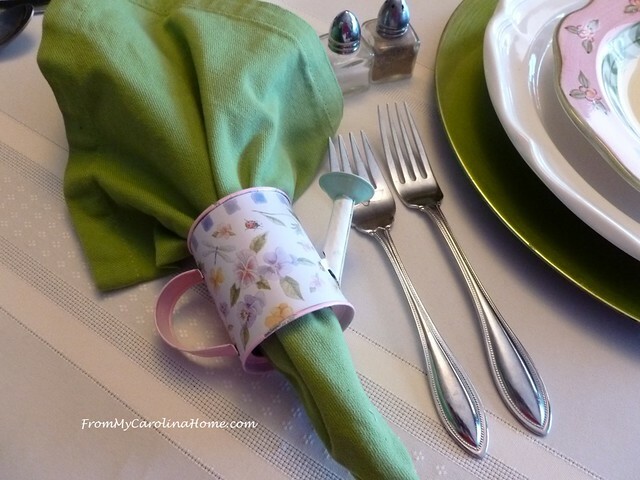 Oh my, I love those watering can napkin rings! So unique! 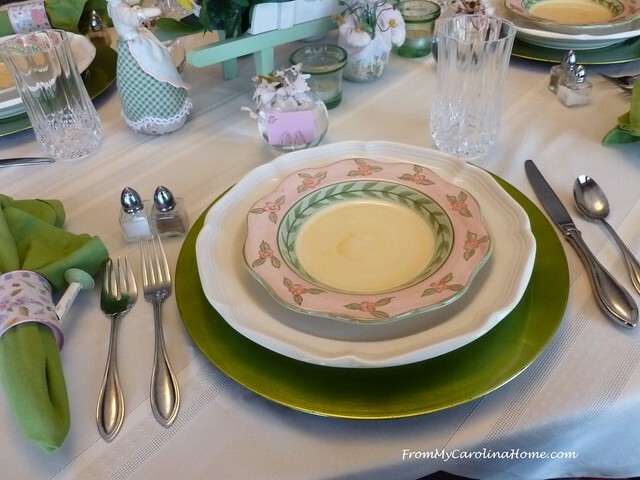 Hello Carole, I really adore this spring table setting you have put together! 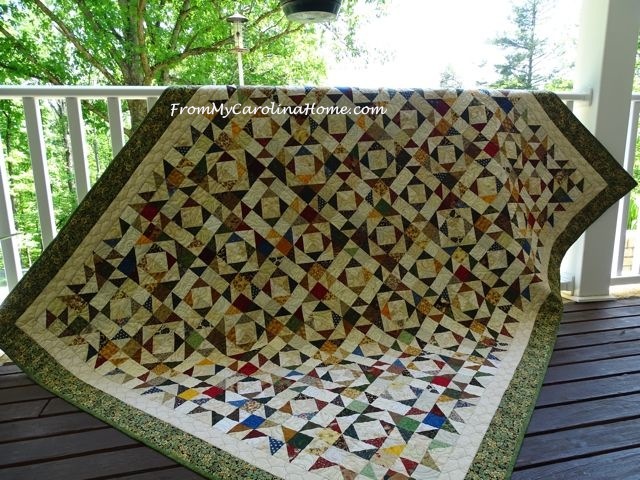 Each and every piece works together so well adding such a delightful all over design. Yet, because of the soft colors and the pieces you used it also makes you want to eye each and every detail alone. I do believe that this is my absolute favorite setting, of course, I say that at each one. Everyone has mentioned their favorite pieces, but I seriously can not because one piece without the other would be missed. 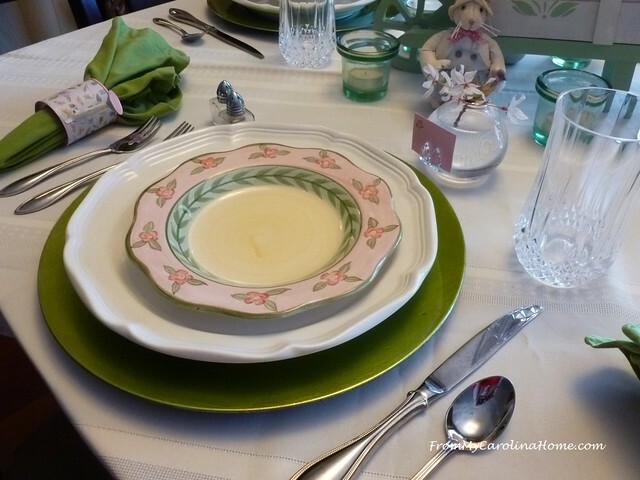 Carole, I hope that you use this table setting in the spring every year from here on!!! Thank you so much for sharing your amazing gift of table setting and bringing this not so used art form for each of us to enjoy and dream of doing. I hope maybe in our new home, in Wyoming (we made the decision final) I will have a table to decorate because I will have family visiting! Have a fantastic day dear friend!! Well, the watering can napkin rings are certainly a hit with everyone. I’ve never seen anything quite like them. Seeing the cherry blossoms on your table gives me hope that we will see some blooming trees soon. I did spy some crocus in my side yard today (guess the bunnies missed that bunch). And I did bring the boxes with my inside bunnies down yesterday though I haven’t unpacked them yet. And a spring themed wall hanging with bunnies is hung as well. Now if the temps would just get out of the 30’s. You have a beautiful Spring/Easter setting. Thank You for sharing. 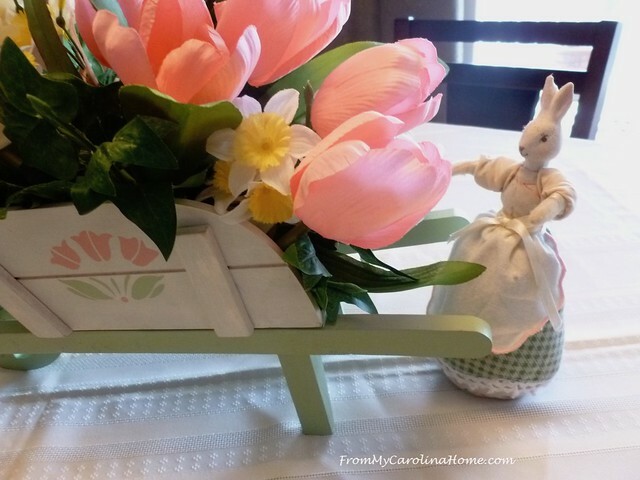 Such a charming tablescape, Carole…it feels like a spring day!